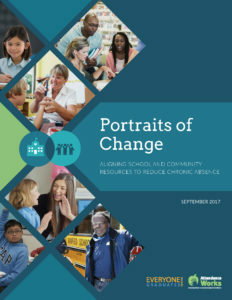 The Everyone Graduates Center and Attendance Works are pleased to partner on Portraits of Change: Aligning School and Community Resources to Reduce Chronic Absence. More than seven million students nationwide are chronically absent from school – missing so much school, for any reason, that they are academically at risk. Starting as early as preschool and kindergarten, chronic absence erodes students’ ability to learn and achieve in school. It increases the likelihood that children will be unable to read well by third grade, fail classes in middle school and drop out of high school. Children living in poverty, from communities of color and diagnosed with a disability are disproportionately affected. When chronic absence reaches high levels, all students – not just those missing from the classroom – may suffer, because the resulting classroom churn, with many students sporadically attending, hampers teachers’ ability to engage and meet all students’ learning needs. While not a substitute for quality teaching, reducing chronic absence is key to realizing the benefits of investments in improved instruction and curriculum. The good news is chronic absence, even when it reaches high levels, is a solvable problem. What works is taking a data-driven, comprehensive approach that begins with engaging students and families as well as preventing absences from adding up. The key is using data as a diagnostic tool to help identify where chronic absence is a problem and target where additional resources are needed for prevention and early intervention. Schools with higher levels typically require a more comprehensive approach as well as more support from community partners and public agencies. Additional resources can be found on the Attendance Works website.